For more than 30 years, our law firm has been working with people throughout Maryland and in Alexandria, Virginia. We prioritize the client’s needs, identifying his or her goals, and developing a plan that focuses on getting those results. Through clear, responsive communication, we are able to build a strong relationship with those we represent, thus providing them with confidence and clarity regarding their case. At McNamee, Hosea, Jernigan, Kim, Greenan & Lynch, P.A., we are fortunate to have more than 25 experienced attorneys ready to tackle any commercial matter. No case is too big or too small for our law firm. We look forward to helping our clients navigate current legal matters, as well as determine and mitigate risks that could appear down the road. 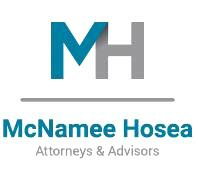 McNamee Hosea Jernigan Kim Greenan & Walker, P.A.